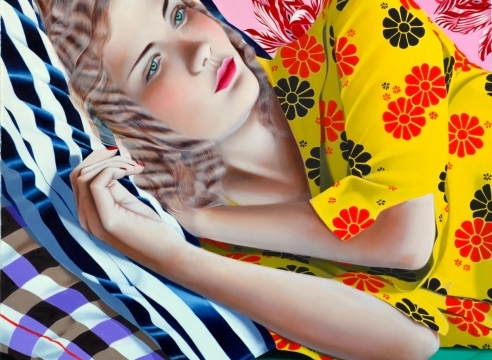 Fredericks & Freiser is pleased to announce an exhibition of new paintings by Jocelyn Hobbie. Hobbie paints hyper-realistic portraits of fictional women that are suggestive but not explicit, beautiful but not naïve. Her subjects are represented in isolated moments of disturbance or repose, yet the dominant atmosphere is a strange iciness that creates a psychological distance, at once familiar and disturbing. Hobbie’s work has evolved to employ an increasingly heightened naturalism and a greater degree of saturated color. She contrasts dense areas of patterning, tattoos, flowers, and other surrogates for vivid moments of experience with a sense of disillusionment or riveted composure evident in her women’s expressions – always elusive and far away. There is also a hint of eroticism captured in the settings as figures are delicately strewn across blankets and propped up in chairs. In some paintings, anonymous hands and legs invade intimate spaces. In others, the focus remains on one woman, wiping away a tear from her cheek, or wearily succumbing to a pervasive spellbound juncture. With an amplified color palette and a neoclassical style, Hobbie exposes the sentiment inherent in her depictions of women’s interior states. Here, she defines and undermines ideas of intimacy, creating a haunting realism, simultaneously artificial and trenchant. Jocelyn Hobbie was born in Northampton, MA. She has had solo exhibitions at Bellwether, New York; Jack Tilton, New York; and Galleria Glance, Italy. Hobbie has been included in numerous group exhibitions, most recently at The Hole, New York. She was featured in Painting People: Figure Painting Today by Charlotte Mullins, published by D.A.P. Hobbie lives and works in New York. Fredericks & Freiser is located at 536 West 24th Street, New York, NY 10011. We are open from Tuesday through Saturday, 10am to 6pm. Contact us by phone at (212) 633-6555, fax (212) 633-7372, or email: info@fredericksfreisergallery.com, and visit us online at www.fredericksfreisergallery.com.